I’ve always found a certain therapy in reading to children – just break open a good book, read aloud and watch the world’s ugliness melt away – at least for a few minutes. So I thought I might begin the new year with a book recommendation to counter the ugly intolerance that is so much on display these days. It is a heart-warming story of the richness of human life. 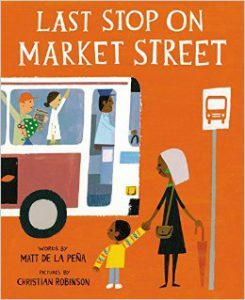 Appearing on a score of lists for the best books of 2015, Last Stop on Market Street is the work of award-winning talents Matt de la Pena and illustrator, Christian Robinson. This affectionate story of a young African American boy and his grandmother reflects the diversity of urban life in a natural and authentic manner, while tackling social class and inequality with positivity. Summary – Every Sunday after church, CJ and his nana ride the bus across town to the last stop on Market Street to volunteer in a soup kitchen. Today, however, a dissatisfied CJ wonders why they don’t own a car like his friend Colby? Why doesn’t he have an iPod like the boys on the bus? How come they always have to get off in the dirty part of town? With each question, Nana points out something for CJ to appreciate about his life: “Boy, what do we need a car for? We got a bus that breathes fire.” Her gentle admonishments, phrased as questions or observations, and her genuine interactions with people help CJ to see the beauty and fun in their routine and the richness of the world around them. The Illustrations – People of different skin colors, body types, abilities, ages, and classes are illustrated simply in paint and collage, with tiny, interesting details that could prompt a dozen other stories. The endpapers show twelve items from the book’s illustrations, repeated in a pattern. These represent identifiable details of characters in the book, and can be used to make predictions in advance of the read aloud; photocopied and clipped to sequence the story; or used as a starting point to create back-stories about the bus passengers or soup kitchen patrons. The Words – Figurative language evokes strong images – “The outside air smelled like freedom, but it also smelled like rain, which freckled CJ’s shirt and dripped down his nose.” A host of dynamic verbs drive the sensory text “(CJ) watched water pool on flower petals . . . rain patter against the windshield . . .” “The bus creaked . . . it sighed and sagged . . . and lurched.” Matt de la Pena’s brilliant text offers many strong word choices to highlight for student writers and readers. The child’s relationship with his amazing grandmother unfolds in believable dialogue – “How come that man can’t see?” “Boy, what do you know about seeing?” Nana told him. “Some people watch the world with their ears.” De la Pena’s use of authentic exchanges like this and colloquial language gives the story a genuineness that will foster a connection for many children. I applaud the author’s intent to use diverse characters and sensitive themes in a depiction of everyday “normal” life. Blind, disabled, poor – these are not synonyms for “other.” Normal can mean different things to different people. This message is woven seamlessly into the story. Last Stop invites children to talk – about special people they are close to like grandmothers; about people who look like them and people who don’t. It is a read aloud that can open minds and hearts to the richness of human life. Visit WeNeedDiverseBooks.org for more information on children’s stories like Last Stop; and to learn about the benefits of reading diverse books.